Employment. Under federal employment law to bring a discrimination claim a plaintiff must prove that an “adverse action” occurred, and to bring a retaliation claim a plaintiff must prove a “materially adverse action” occurred. The question in Kalamazoo County Road Commission v. Deleon is whether either can be proven when an employer grants an employee’s request for a job transfer (and the new position turns out to be less desirable than the old position). The International Municipal Lawyers Association (IMLA) filed an amicus brief in this case. Housing discrimination. For the third time the Court may take up the issue of whether disparate-impact (as opposed to disparate treatment) claims can be brought under the Fair Housing Act and, if they can, what burden of proof applies. If the Court accepts Texas Department of Housing and Community Affairs v. The Inclusive Communities Project it remain to be seen whether it will settle like its predecessors, Mt. Holly v. Mt. Holly Citizens in Action and Magner v. Gallagher. IMLA filed amicus briefs in both previous cases. Police searches of hotel registries. A Los Angeles ordinance requires hotels to gather data on guests and allows police to inspect hotel registries without a warrant. The first question in City of Los Angeles v. Patel is whether facial challenges to ordinances are possible under the Fourth Amendment. The second question is whether police can inspect hotel registries without a warrant. Qualified immunity interlocutory appeal. When a district court denies a government’s motion for summary judgment in a qualified immunity case the government may seek interlocutory (immediate) review of that decision. But what if a district court simply refuses to consider a government’s motion for summary judgment in a qualified immunity case? Is interlocutory review still available? IMLA filed an amicus brief in Schultz v. Wescom. Pregnancy counseling centers. A New York City ordinance requires pregnancy counseling centers that have the appearance of being medical facilities to disclose they don’t have a medical license. The issues in Pregnancy Care Center of New York v. City of New York, New York are whether requiring this disclosure violates the First Amendment and whether the “appearance” criteria is unconstitutionally vague. Accommodating mentally ill suspects. In City and County of San Francisco, California v. Sheehan police entered a mentally ill woman’s apartment, she threatened them with a knife, and they retreated. Upon re-entry, police shot her after she threatened them again. The first issue is whether the Americans with Disabilities Act requires police to accommodate armed, violent, and mentally ill suspects when bringing them into custody. The second issue is whether the officers in this case should be denied qualified immunity because they could have anticipated her resistance. IMLA filed an amicus brief in this case. 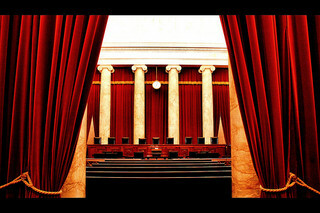 While the “long conference” is only a few weeks away, it may be a while before the Court decides whether to grant or deny any of these petitions, even those set for the “long conference.” The Court frequently relists cases, or postpones deciding on petitions until later conferences during the term. Want to know more about what the Supreme Court’s term holds for local governments? Register for the SLLC’s FREE Supreme Court Preview webinar to be held on October 16 here.